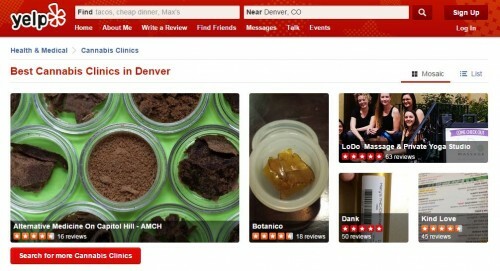 Review site Yelp terminated an advertising agreement with a Denver massage studio last week because the business’ website includes information about its popular “Mile High Massage” — a service that utilizes lotions infused with THC, the psychoactive compound found in cannabis. Yelp also reclassified the business, LoDo Massage & Private Yoga Studio, as a “cannabis clinic” — a designation normally used for recreational pot shops and medical marijuana dispensaries — “because they offer massages with THC-infused lotion,” a Yelp spokesperson said this week. Marijuana-infused topicals, lotions included, don’t get users stoned in the same way smoking, eating or vaporizing cannabis would. Yelp’s advertising decision doesn’t impact LoDo Massage’s free business listing on the site. But until LoDo Massage removes that still-controversial acronym for tetrahydrocannabinol from its Yelp listing and its website, the business will not be allowed to advertise on Yelp — which place’s a business’ ad above the organic search results in that category. LoDo Massage owner Rich still doesn’t understand why his massage studio is listed as a cannabis clinic. Currently the Yelp page for “Best Cannabis Clinics in Denver” lists LoDo Massage alongside Dank, Kind Love, Botanico and Alternative Medicine on Capitol Hill — all marijuana shops.